Our Winner Is . . .
Wowser! Over six hundred entries! I think a giveaway this exciting needs a really great introduction, don't you? Maybe some balloons, or fireworks . . . definitely need a drum roll and a trumpet, too! How about a round of applause for all of you wonderful peeps!!! OK, OK, I see you coming toward me, ready to shake me till my teeth rattle --- I'm announcing the winner RIGHT NOW!!! Mr. Random thoughtfully chose . . . The numbering system starts over again at 200 . . . that's why her comment is numbered 120, but is actually 520! Congratulations, Lesley!! 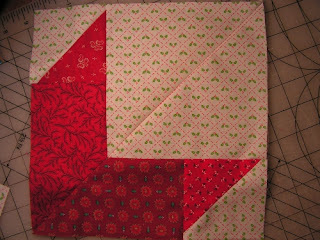 So happy for you - you will LOVE the Accuquilt Go!Baby! I'll be sending you an email momentarily . . .
You'll also receive the three dies of your choice, and the yummy layer cake of Chemistry, by Cosmo Cricket, from the Green Fairy Quilts online store! 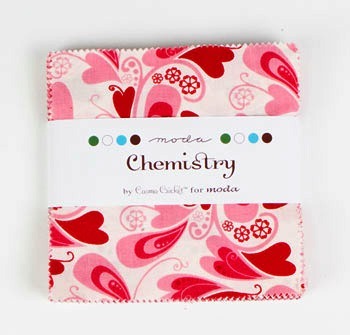 You are the winner of the cute charm pack of Chemistry from the Green Fairy Quilts store! A great big THANK YOU to the folks at Accuquilt, for sponsoring the giveaway, and to Green Fairy Quilts, too, for the fabric! And thank you, the lovely members of the quilting community for following our blog and entering the giveaway! 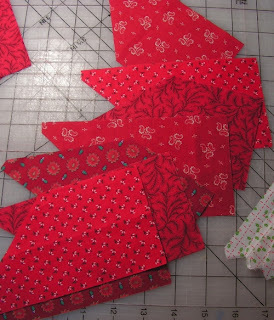 We are guest posting on SewWeQuilt on Thursday, and another fabric giveaway starts then, so you might want to stop in again and see what we're up to, here at Lilypadquilting! Just sayin' . 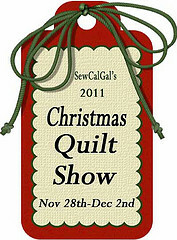 . .
Christmas Quilt Show Begins Today! Huzza! Today is the day we've been waiting for! (Well, some of us have, anyway!) 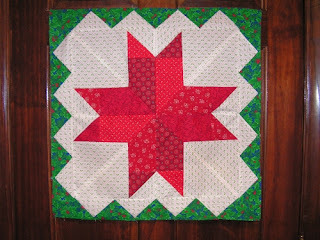 The Christmas Quilt Show begins today at SewCalGal's blog . . .
Be sure to go by there and check it out! 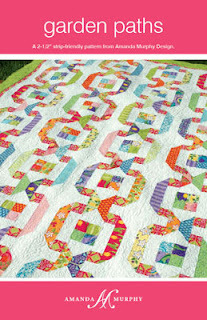 There are lots of fabulous prizes to be won, and lots of inspiring quilted projects to admire! 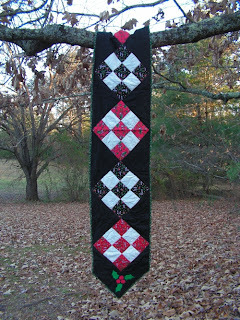 Here is my entry --- a hand-quilted tablerunner! 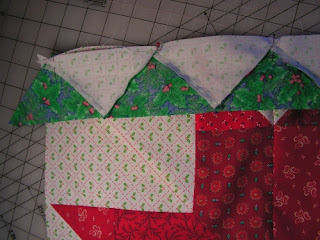 I created this from a mix of Christmas and Mary Engelbreit fabrics, and created large nine-patch blocks. I set them on point, and then stitched some fancy stitching on the seams and edges. See? It is quilted with swirls and stars in the black background areas, and then the holly leaves and berries at each end are appliqued. You can take a closer look, but don't be too judgemental --- this was one of my very first projects, so be gentle, OK? 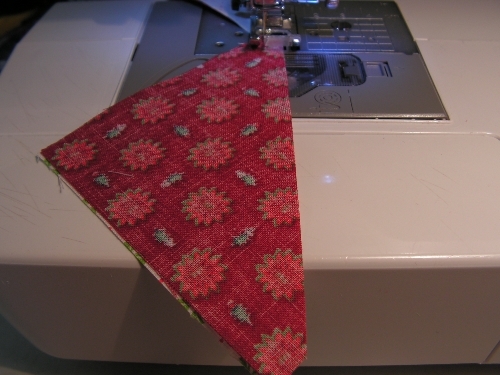 I backed it with a green candy cane fabric, and brought it around to the front for the binding. I wish that I'd had a brighter day to make my photos, but hope you can see it alright. 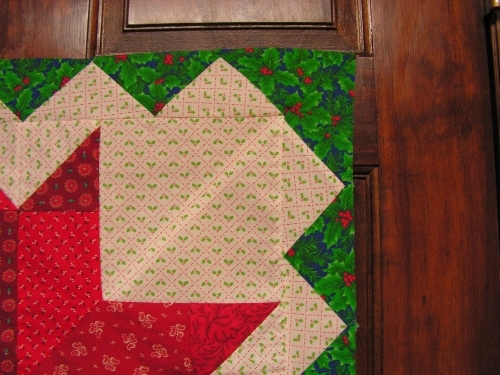 I hope you like my Christmas quilted tablerunner! Have fun checking out all of the other entries in the show! You have only two days left to enter our big giveaway! Click here to zip over to the page where you can enter to win an Accuquilt Go! Baby, three dies, and a layer cake of fabric from Green Fairy Quilts! The giveaway vibes have been humming here at the Lilypad! 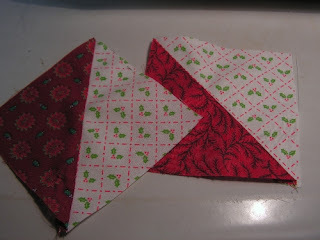 First I received word from Corrie and Des at Quilt Taffy, that I'd won a lovely charm pack of So Sophie! Squeeeee! I do love me some Riley Blake! 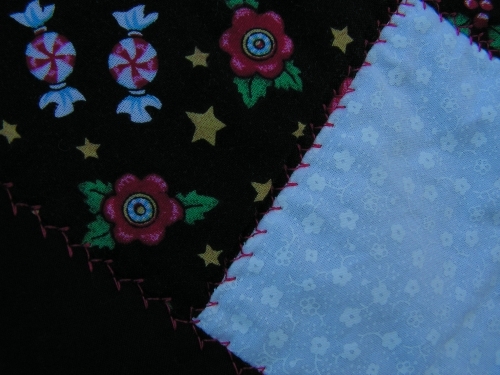 Y'all should go and check out the Quilt Taffy blog, and spend some time looking around at their store, too. 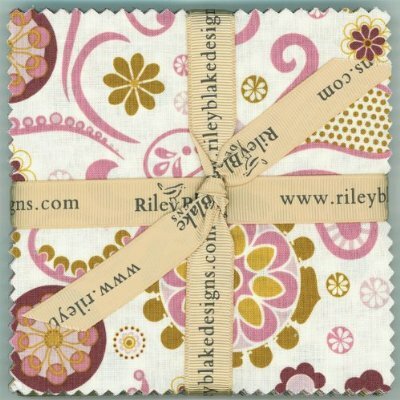 They have lovely fabrics, and even lovelier sales! :) We'll wait right here till you get back, OK? I'll just think about how I'm going to arrange some of my Christmas ornaments for a table display, while you are gone . . .
You're back? OK, back to our story . . .
Then, Melissa at SewBittersweet Designs blog let me know that I won over there! (I really think you should click there and go to visit her - she has a lovely blog, and is a sweetie - I can't say enough good things about her tutorials on blocks. She recently posted a wonderful Christmas one....tell her Snoodles sent you, OK?) 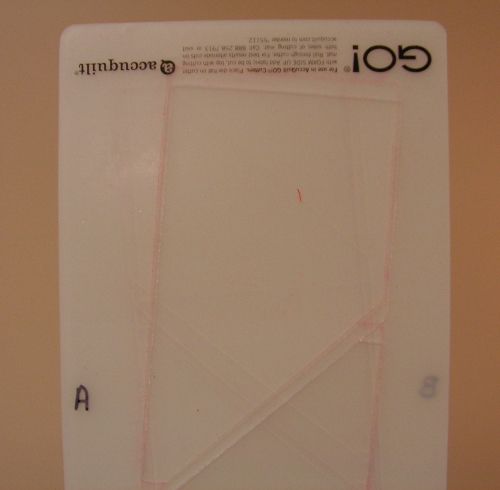 I received a cool tool --- an awesome ruler that makes Flying Geese and Stars even easier! And the fabric portion of the prize? Feast your eyes on this selection of fabrics from the super folks at Fat Quarter Shop . . . I'm warning you, you might drool over this one . 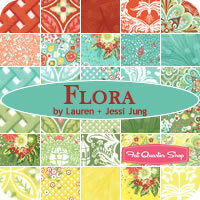 . .
Yep, it's the beautiful Flora line! My prize was a jelly roll of Flora! Yum! I love Amanda's patterns, and she has some new ones out now, too! Check them out at her site, OK? I'm thinking I might try to find some Kona pale yellow to be my background - nice and sunshiny! Post your wish list so they'll find it for Black Friday! AccuQuilt is hosting yet again another scavenger hunt on Facebook! Go to AccuQuilt’s Facebook page or click on the link below for more details on how you could win one of three fabulous prizes from Brother, American Quilter’s Society, or AccuQuilt. It’s easy to register! 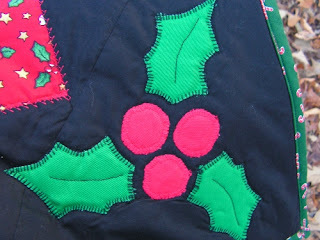 Happy Black Friday to everyone --- but count me out....I'll be hunkered down at home, sewing!! 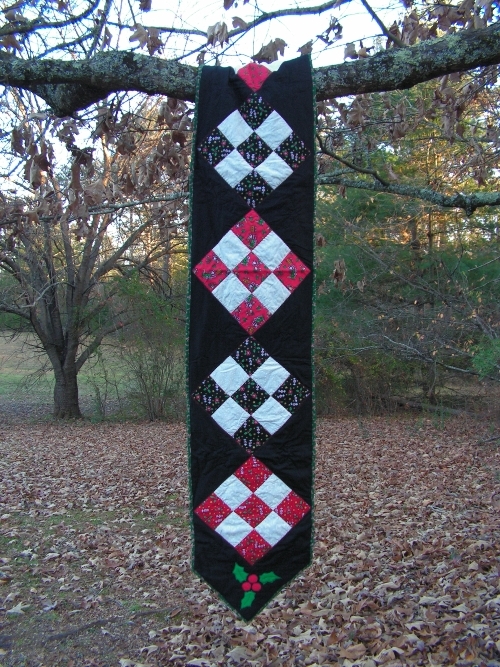 If you haven't signed up for our bodacious giveaway, please click here --- you don't want to miss the opportunity to win an Accuquilt Go! 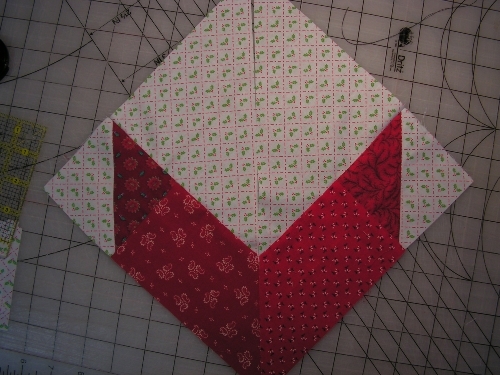 Baby, dies to go with it, AND free fabric from the Green Fairy Quilt store! All of us here at Lilypadquilting wish for you and yours a peaceful and blessed Thanksgiving . . . we invite you to join us in thanking God for His care and compassion, and for the many blessings that we enjoy. We'll be back in blogland soon! 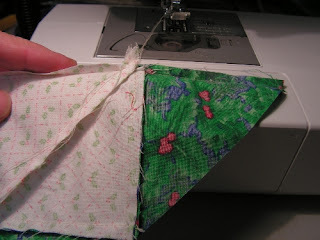 I realized that I had never actually completed a review of the Accuquilt Go! Baby for you special peeps! Although I bet by now, you know that I am over the top in love with this baby! Hoppy Froggies! I can get more fabric cut FAST and ready to piece with this sweet thing, than I could ever hope to do with my rotary cutter, ruler, and mat (and my achy hands). 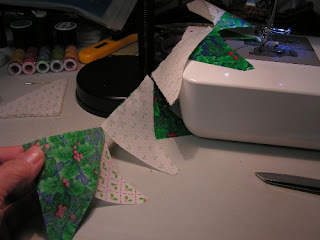 Not only does it turn out pieces quickly, it cuts them out in shapes that eliminate the little "ears" that happen with half square triangles -- taking out another time-consuming task for us! I do have two tips that I think will help those of you who receive a Go! Baby for Christmas. It * IS * on your wish list, right? 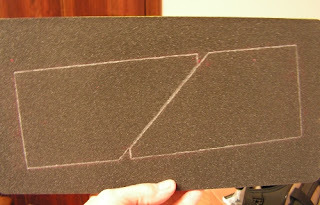 I had heard that if you have dies that are all one color foam, you should mark the outlines of the blades, to help with aligning your fabric. (Ya don't want a chisel piece that's not all there, right?!) 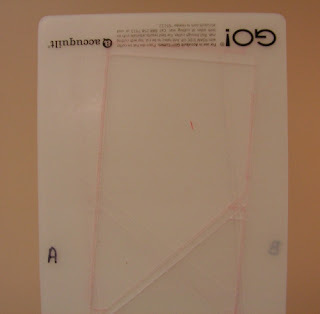 I heartily agree --- the first thing that I did after unwrapping my dies, was to mark them with a silver sharpie marker, so that I could see the outlines of the blades. See? This makes it much easier when I'm scrap-busting, too, to get the fabric over the correct area, to get whole pieces! I can lay small pieces of fabric over each chisel, and get lots of different, scrappy pieces to make a project! 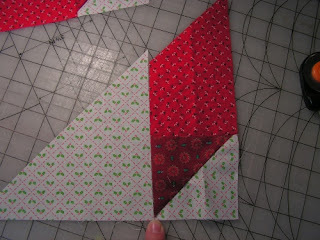 Now it's a simple matter to alternate the sides when I am cranking out hearts, chisels, and half square triangles! So you might want to try that, too! Now, today you are getting two reviews for the price of one, because I'd like to tell you about the Green Fairy Fabric store, too. Many of you already know about them, but for some of you, they may be unfamiliar. Clint and Judi are the kind and gracious hearts behind the Green Fairy Quilts ministry, taking quilts and school supplies to needy kids in Romania. You can check out the videos from past trips right here. 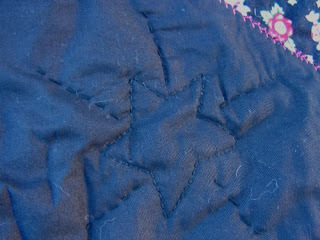 Also, Judi is a genius with her free motion quilting --- you can check out her blog and see numerous examples of her gorgeous work. To me, that would be the equivalent of handing my quilt sandwich over to a Raphael or Michaelangelo . . . no, I'm not kidding. Take a look at this post and you will see! Isn't that awesome?! Clint and Judi are devoted to their family and so a home-based business was perfect for them. And Green Fairy online store is -- well, how can I say this --- addictive! Go and check out the lovely fabrics that they have there: jelly rolls, layer cakes, bundles and yardage, and even a Pre-purchase section so that you can drool over what will be in the store in the coming months! I love their selection of charm packs, too. Right now they have some sale prices that you really should check out, OK? Just sayin' . . . 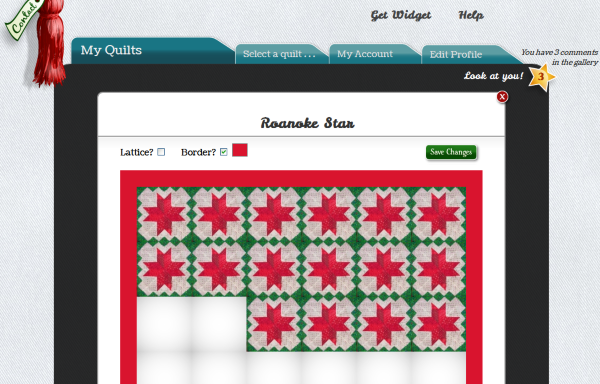 Many thanks to both Accuquilt, for the opportunity to give away a Go! 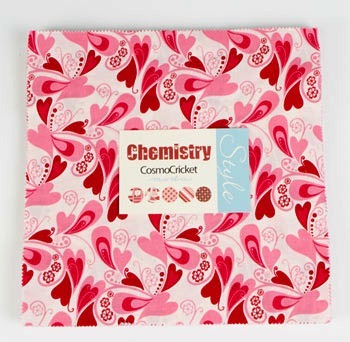 Baby, and to Green Fairy Fabrics, for sponsoring a layer cake of Chemistry, by Cosmo Cricket, to go along with it! 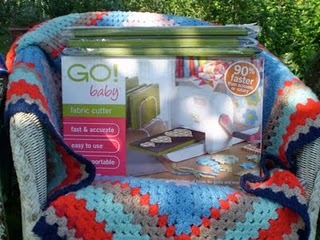 Giveaway starts today -- Accuquilt Go!Baby and fabric, too!! Update: November 29, 12:01 AM This giveaway is now closed.....winners will be announced on Tuesday after my first cuppa coffee! The long awaited day is here! We're starting our giveaway, and one lucky ducky winner will receive an Accuquilt Go! 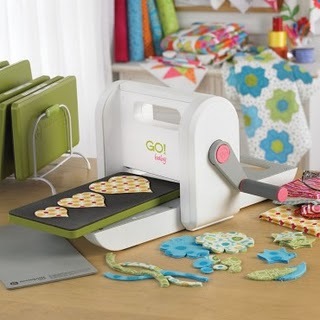 Baby fabric cutter, three dies of their choice, and a layer cake of delicious fabric from the Green Fairy Quilts online store! Whew! That was a mouthful! Let me grab my cuppa tea and we'll get this show on the road! So my table topper, even tho the star is a little differently shaped, is my tribute to a wonderful landmark that I remember seeing as a child. Ready to begin? I do need to warn you --- this post is full of pictures for the tutorial, so hang in there and stay with me till the end, OK? First thing you want to do is get out your fabulous Accuquilt Go!Baby and cut some scrappy 3.5 inch half square triangles . . . Some equally scrappy chisels . . .
And then some half square triangles out of what you might think of as a "background" fabric. You want a pretty sharp contrast between your other die cuts and these. What? You don't have a Go! Baby? Hmmmm, we'll have to take care of that later! Ask me how I know. Well, don't, actually. Just pay attention to yours; you don't want it to look like a pyramid drawn by a tipsy Egyptian architect . . .
You will actually need eight of these bad boys, and if you want to make them up ahead, that's cool. 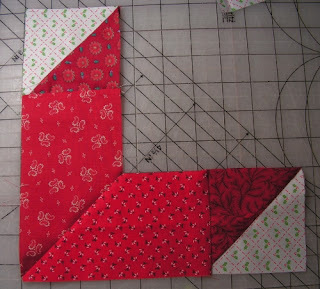 I made the star in four blocks, and just did these units as I went. Now, if you want to work with your units and see how they will play together, you can do that now . . .
Now, put these pieces right sides together, pin, and sew! Make another unit just like the first, and you can lay them out to see what they will look like. 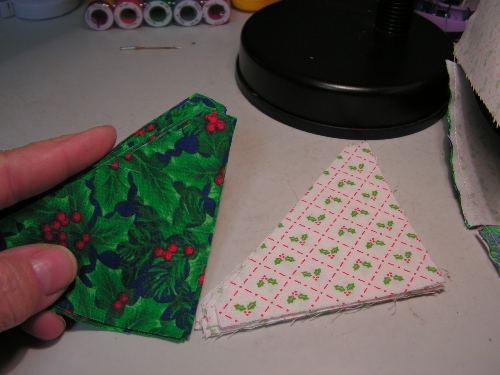 Aw, go ahead and sew those together! You now have your first block for your star! A word to the wise here: I found it helped immensely to starch my 6.75 inch squares before cutting them into triangles. 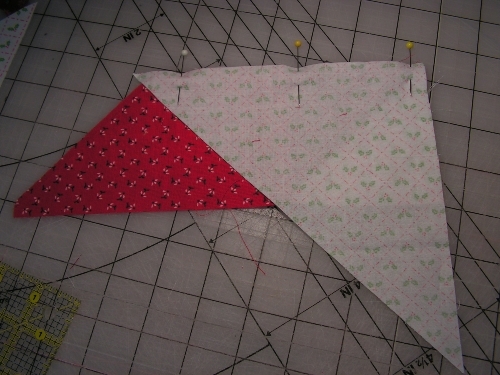 They held their shape while I sewed that bias (gasp!) seam.
. . . and sew it to the first block, to make half of your star. 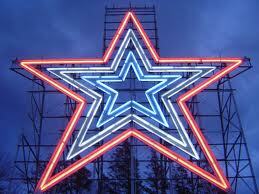 Repeat to make the other half, and then join the two halves of the star. So when you open that out, and iron it carefully, you will be ready to join the borders on the corners, much like you would a mitered border. You'll fold your whole star and the borders on the diagonal, and sew those border edges together. 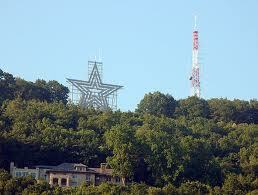 (Trumpet fanfare) And this is what your finished Roanoke Star will look like! 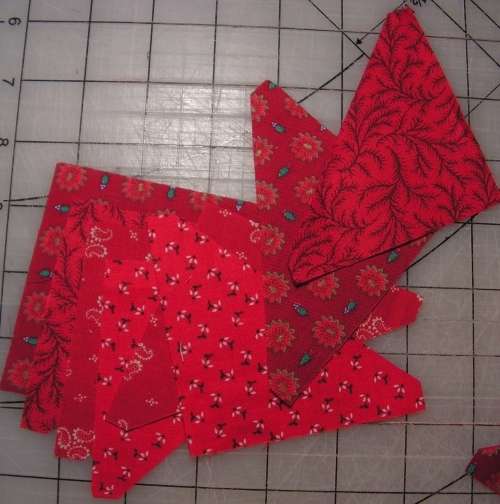 I'm going to hand-quilt mine, and add a narrow red binding. Then it will sit on our table and look festive! 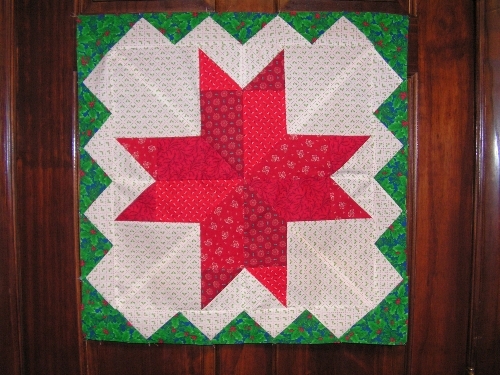 At a finished size of twenty-two inches square, it is a super size for a tabletopper, all by itself. But you know me, I can't miss an opportunity to show you how I used it on OleFrogEyes design wall! Look at the awesome secondary patterns this block makes! Now I can hear what you are saying . . . this is all very nice, but let's get to the important stuff! Alright! Your wish is my command --- today the entries begin for the giveaway. And here are the prizes in this bodacious package! First on our list, an Accuquilt Go! Baby die cutter! Whoooo hoooo! 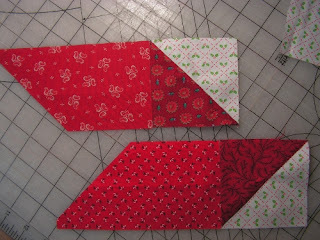 Next on the list, three dies to use in that wonderful Accuquilt machine! That's why I told you to check out this link and this one, and be ready to tell us which three dies you would choose! Last but not least, some fabric to use with your new cutter! 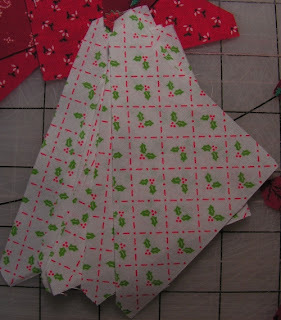 Feast your eyes on the prize that the Green Fairy Quilts store is going to ship to our winner! It's the new line by Cosmo Cricket, called Chemistry! Hoppy froggies! 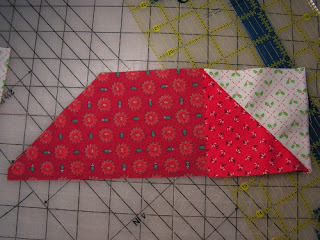 A layer cake of yummy fabric goodness, with absolutely no calories or carbs! 1. Leave a comment telling us what three dies you'd choose with a Go! Baby. 2. We love our followers, so if you follow here, leave a comment and tell us. them with comments there! OK? OK! and leave me a link to say that you did. one of the lines coming in December has caught your eye. SPECIAL DRAWING . . . wanna see what you can win? It's a charm pack of Chemistry, by Cosmo Cricket -- our generous sponsors, the folks at Green Fairy Quilts, have said they'll provide this yummy charm pack for the blogger that we pick from that special drawing! So if you help us spread the word, leave a comment and tell us - and you'll be in that drawing! Now, I know that some of us are already preparing for Thanksgiving; there's a lot of baking and defrosting and prepping going on. So, we are going to leave this giveaway open for a week --- it will close at midnight (Eastern) on next Monday, November 28, and we'll announce winners on Tuesday! That way everyone has time to enter as many times as they would like to! 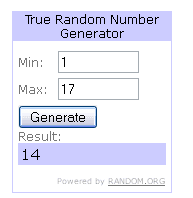 Well, there you have it --- lots of ways to get entries into the drawing. And one of you lucky peeps is going to win an Accuquilt cutter, three dies, and some fabric! Hoppy froggies! The Mailman's been good to me!